This is our second cache in Pirunlinna and very different from the first one. Welcome! From that point the bearing to the cache is 74.23 degrees. From that point the bearing to the cache is 273.24 degrees. The angle values are true bearing. Zero degrees is pointing to locations having equal longitude in WGS84 and higher latitude value, 90 degrees is pointing to east. Here the Finnish YKJ coordinate system is not parallell with WGS84, at this point the rotation angle between the systems is about 2.8 degrees. The nearest KKJ zone gives, however, somewhat better accuracy. The magnetic deviation here is about 6 degrees, don't trust your compass too much! The geometry is quite sensitive to angular errors, one degree error may yield about 40 meter error in position. The cache is multi-cache type. 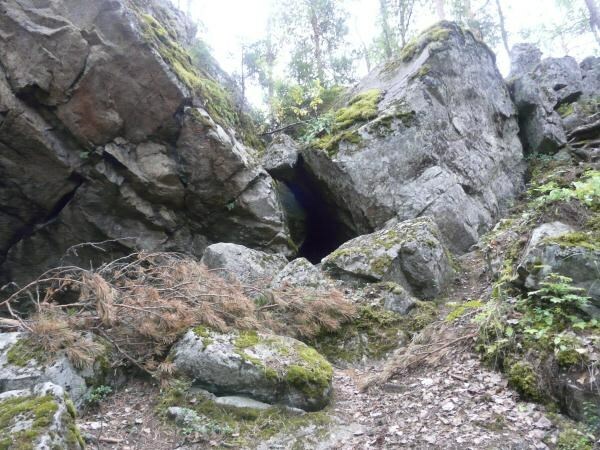 Angular calculations guide you to the position of the first step where a small/regular container is well hidden in a first cave located in one of the sides of Pirunlinna. A picture illustrating the cave opening is attached. Only some meters from the cave opening there is a small unofficial camp under a big stone, people have had there open fire. First step contains position information about the regular sized and carefully hidden main cache. Both steps require crawling through caves. The first container is not visible, but you can feel it with your right hand, if you are tall enough (about 180 cm). The second container is behind some small stones. You will absolutely need a flashlight, even in daytime. Your clothes will become dirty when searching the cache. Please, be very careful! Take a friend and a safety helmet with you. Just as we were about to engulf ourselves in this dismal passage, I lifted up my head, and through the tubelike shaft saw that sky I was never to see again!